In the present busy world, no one has the time to spend on their cleaning. On the other hand, the dirt and dirty stuff are increasing in the house day by day. At this point in time, it is a big reason for the people to worry about. 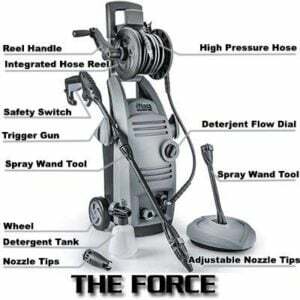 THE FORCE 2000 Pressure Washer is such a device who can solve your problem. It has attractive features and working performance that will blow your mind. It will save your time, and the fun part is that you can easily do your cleaning yourself. When you go to do your heavy or medium duty cleanings, the 2000 PSI water force will help you. The device will provide you 1.6 GPM water flow to adjust the high water force. There is a spinning patio cleaner for your convenient cleaning that you don’t usually get a pressure washer. Being an electric pressure washer the device doesn’t give you the trouble of power source. According to ToolsMaestro.com your standard home electric line is enough to run the machine. There are many other benefits that you will get with this pressure washer. The device has 110 Volt – 60 HZ that runs on AC power that is easily available in all the houses. The working pressure that the device generates is 1800 – 2000 PSI and 3000 PSI “IPB” (Initial Power Burst). It has got the facility to provide 1.6 GPM of water flow. The combination of water pressure and water flow is fantastic. There are a 20-foot hose reel and a 35-foot power cord for your going around the cleaning place conveniently. The hose reel has a foldable hand crank that makes the device compact. The power cord has GFCI facility for your safety reason. You can easily work on a wet ground without taking much risk. The hose has the capacity to tolerate high water pressure and it is easily connectable. To prolong the motor’s life and your pump’s safety the device provides you TSS (Total Stop System) facility. So when you are not using the device while connected to the power, you are safe. There is a pro-style spray gun with a quick connect facility to the hose. The easy hold of the spray gun will prevent any kind of fatigue. The dimensions of the device are 10” long X 12” wide X 33” high. The weight of the machine is 23 lbs, and the shipping weight of the total product is around 25 lbs. There is a warranty of one year. The device has an excellent onboard storage facility to make it look compact. The size and the weight are pretty convenient to carry it around. Strength: To clean your heavy duty filth you need a powerful machine that can provide you high water pressure. 2000 PSI water pressure should be enough to clean most of the heavy filth from your house and make it clean. 1.6 GPM is also a very good water flow rate to clean the dirt easily. So if you think of power the machine has it all within itself. TSS (Total Stop System): This is a wonderful facility for avoiding any injury and increasing the machine’s life. The feature shuts off the engine when the trigger remains idle, or you are not using it. This is an essential feature of a modern electric pressure washer. The device makes you stay with the modern technology. 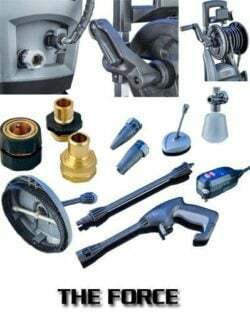 Convenient Components: The machine gives you all the advanced components which are of very high quality. The brush motor has a thermal sensor to protect from overheating. The spinning patio cleaner is an excellent addition that helps you to clean your patio with ease. The hose is HP hose, and the power cord has GFCI facility. Perfect Size: People face problems with the large machines and it is really annoying. THE FORCE 2000 Pressure Washer has a convenient size for your easy carriage. You can easily take your machine wherever you want without any hassle. It doesn’t even take much space in your garage. Warranty: You will get one year warranty of the machine from the date of your purchase. In one hand it protects your valuable investment and on the contrary, it makes you confident in using the machine. The warranty of the device is available in 48 Continental United States. So, if you order or do shipment other than these places you might have the problem with your warranty. The warranty is not exchangeable. The device is designed only for residential use. So you cannot use it for commercial purpose. The price is THE FORCE 2000 1.6 GPM 2000 PSI Electric Pressure Washer is not very much. So being a medium earning person you can easily be the owner of this device. All the features of this device are very attractive with the cutting edge technology. The reviews that we got from its users are pretty much satisfied with its performance. To stay with the time, you can buy this machine and clean all the dirt from your house.